Shofar, so good. . .
We've spent the past couple of days in the north, my favorite part of Israel. I love the Galilee: the sense of spaciousness, the verdant landscape, cascades of blooming flowers, rugged mountains, sparkling blue waters of the Kinneret (Sea of Galilee) and the generally laid back pace of life. This afternoon, we ate lunch in Rosh Pinna, which has become quite the upscale town. It reminds me a bit of Boulder, Colorado, with its mountain views, abundance of fine restaurants, tasteful affluence and left-learning politics. Then we continued up the mountains to Tzefat, the home of Lurianic kabbalah. One can see why Jewish mysticism took root here. There's just something in the atmosphere that inspires spirituality and awe. The town is perched high in the hills, opposite Mount Meron, where one finds the tomb of R. Shimon bar Yochai, the purported author of the Zohar. With its winding, narrow alleyways, steep stairs, historic synagogues, and eclectic population, it is not hard to see the appeal of the place to visionaries--from Rabbi Yitzchak Luria, the Ari, to a host of contemporary artists. Time just moves differently here. But my favorite part of today was a trip to Kol Shofar, a family-run shofar factory in the Golan Heights. We learned a great deal about the shofar on our tour. It can be made from the horn of any animal except a cow (due to the association with the Golden Calf). Our guide, the son of the founder and master shofar crafter, reminded us that the Hebrew word shofar is derived from the verb l'shaper, meaning "to improve." The shofar calls us to improve ourselves. At Kol Shofar, interestingly enough, most of the horns come from Islamic countries. In those places, people slaughter the animals primarily for food, then sell the shofar as a by-product to the factory. The horns are cut and sometimes heated and straightened, their mouth-pieces are shaped and then drilled, and then they are (mostly) polished (some Sephardi Jews, following Maimonides, prefer to use an un-polished shofar). We saw shofars made out of the horns of rams (most common and often preferred), goats, ibyx, kudu and sheep. The Mishnah (Rosh Hashanah 26b) has a dispute between the Tanna Kamma (the first, anonymous opinion) and R. Yehudah regarding the shofar blown on Rosh Hashanah. According to the Tanna Kamma, the shofar used on Rosh Hashanah should be straight and from a ya’el. According to R. Yehudah, it should be from a male (and curved). The Gemara asks why the Tanna Kamma prefers a straight shofar and R. Yehudah a curved shofar and answers that according to the Tanna Kamma on Rosh Hashanah people need to straighten their minds and according to R. Yehudah they need to bend themselves in prayer. R. Yehudah won the day and the curved shofar--reflecting the impulse to bow before the Creator--became the norm. But the straight shofar from the oryx appealed to my aesthetic and, perhaps more critically, my tendency towards inconoclasm. I like to question established norms, even as I respect traditions. With that said, the older I get, the better I understand this notion of bending before the Heavens. Next year, I will proudly sound my straight oryx shofar. But as I do, I will also think of the words of a poem that I wrote a few years ago. I'll end this post with it. When we first came to Israel, we were staying in a very small apartment in Tel Aviv. Then, after three nights, we went to a house that belonged to a guy named Steve. It is in a place called Yavne'el, which is in the Galilee. The house is very nice and cozy and very, very big. I love it. In the back yard, there is a swing, a foosball table, and a little pool. The view is also really nice. You can see a lot of trees and nice houses with red rooftops. As I've been staying here, I've been getting more used to it, but still thinking that all of it is nice. At the shofar factory, they had an orange tree there. I climbed the tree and ate three oranges. They were delicious--the best oranges that I have ever had fresh! After the shofar factory, we had lunch at a place called "Spaghettim." I ate four whole pieces of pizza. I really, really, really liked the pizza. Then we went to Tzefat. We went to a place where they made and sold candles. Their candles were amazing. They had candles shaped with wax of David fighting Goliath, Noah's Ark (filled with lots of Disney characters), and right when you walked in the doors, there was a candle about nine feet tall. Tomorrow we will go to Jerusalem. Every time I travel to Israel, I get the inevitable question from friends and acquaintances back home: "Is it safe?" Sometimes, when the one posing this query knows that I am bringing my children, there is even a whiff of judgment in these words, implying: "How could you take your kids into a war zone?" My first response is, therefore, often a bit defensive. But when I reflect on what lies behind the question, I can be more empathetic--because the one asking it really has no idea what life is like here. And so I answer: "If all that you knew about Boise (or fill in the blank with your own home town, any city or outpost almost anywhere) was what you heard in the first ten minutes of the local news, you'd think it was a terrifying den of meth labs, arson, gang violence, bar fights and domestic abuse." In other words, the media distorts the reality. This is not what some see as a right (or left) wing plot with an ideological agenda. It's just the media playing to our lesser angels, the part of ourselves that will sit glued to the screen all day to follow the (usually erroneous) details of the latest school shooting. If it bleeds, it leads. So here's the thing: Israel does sit in a dangerous neighborhood. Israelis do live knowing that they and their children will serve in the army, and there is a good chance that they will be called up to fight in the next war. But daily life here is safe. Very safe. Safer, I think, than most places in the United States. Israeli life is not all about war and terror and negotiations and elections determining the fate of the Middle East. It is, instead, about the struggle to earn a living, to raise families. It's about going to school and to work and out to restaurants and clubs, about dancing and the beach and driving (oh, there I go with the driving again) in aggressive traffic, and talking too many minutes on the cell phone. And it's about friendship and family. And celebration and joy and art. In other words, daily life in Israel is deeply human and ordinary, with all of the ordinary joys and sadnesses, failings and success. I spent most of yesterday walking around Tel Aviv with my children and my niece and nephew. We saw all of this stuff: kids on playgrounds, masses of people shoving their way into Dr. Shakshuka, a wonderful Yaffo restaurant with North African Jewish food (so much better than our stereotypical bland starch-laden Ashkenazi fair), Breslover hasidim (the hippy hasids) proselytizing through ecstatic dancing and chanting, and some spectacular street art. I've posted a few pictures below. This is life in Israel. Sometimes frustrating, sometimes wonderfully satisfying. Chaotic, celebratory and, for me, often crazy-making at the same time. Jewish life in a Jewish state. Where, to my constant amazement still, after so many visits here, when you leave the supermarket on Friday afternoon, the gruff checkout clerk wishes you, "Shabbat shalom." Today was my third day in Israel. It was very fun. I went to have lunch at a very good place called Dr. Shakshuka. I had a hot dog but I didn't like it that much. We walked there, and it took us about an hour and a half. I walked with my two cousins, Josh and Dana, and my Dad. While I was walking there, I got tired, but then my Dad told me to eat an energy bar. Along the way, I went to very fun playgrounds. One had a HUGE rope net that I could climb in. I really enjoyed it. Nearby that park, there was a really nice fountain. I went into it and I got soaking wet. I only went in because I got so hot and sweaty climbing up the net about eight times, all the way to the top. I climbed much faster than anyone else in the park. I was kind of cold after going into the fountain. Luckily, my Dad brought an extra shirt, which I got at a Boise State Broncos game, that I could change into. I also went a couple of times onto a really spinny thing. Before that, me and my cousin Dana rode a skate-boarding thing. It turns out there were a lot of spinny things back there, so me and my cousins went there. Tonight we had Shabbat at the beach. We put candles down inside the sand, then we got to light them with a lighter. The lighter didn't work as well as we thought it would, but we got the candles lit. My Dad also brought some wine that we drank but it was not so good. To put the candles out, we put the fire into the sand. Then my cousin Josh said the motzi blessing for the bread and he and my Dad ripped it into pieces so we could eat it. I had a very fun day. We spent much of our first day here in Tel Aviv walking on the promenade that runs along the course of the beachfront from Tel Aviv to Jaffa. 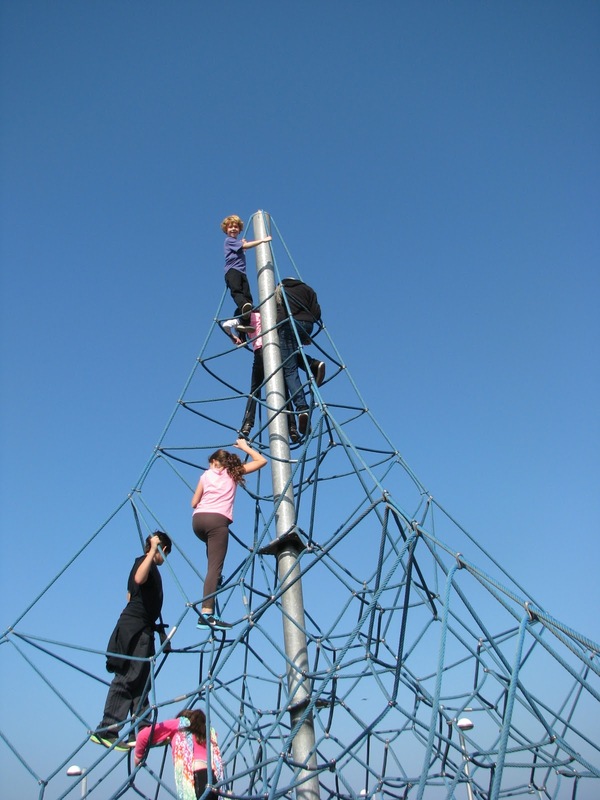 It's a fantastic hike with children, because there are playgrounds strategically stationed all along the way. As a result, you don't get anywhere too fast (at least not with Jonah, who LOVES to climb) but you enjoy the journey a great deal. And on a gorgeous winter day, 70 degrees and bright sunshine, it's really all about enjoying the journey. Israeli playgrounds are terrific--much more entertaining to the kids than their American counterparts (again, this is Jonah's first-hand endorsement rather than my alter kocker's pontification). There is, I think, a reason for this: Israel is a much more risk-tolerant society than America. At home, playgrounds are, above all, safe. This is essential, because Americans are litigious. If a kid gets hurt on the monkey bars, there is a good chance that the parents will sue someone. So. . . we take away the monkey bars. Americans believe in the myth of absolute, perfect safety. This is, of course, a delusion. Life is messy and there are no guarantees. But we do, mostly, mange to make things very, very safe--at the cost of simultaneously decreasing our tolerance for risk and diminishing our (or our children's) pleasure. Israelis are, by virtue of where they live, immune to this myth of perfect safety. They dwell in a very dangerous neighborhood. They know that one can not litigate away all threats and dangers. So their kids get playgrounds that are really, really fun. That means you can spin on wildly turning metal platforms, hang upside down high off the ground, climb without safety nets. American parents find it nerve-wrecking. But the kids love it. And it is, I think, pretty true to life. That said, there is a downside to Israel's tolerance for, or even propensity toward, risk-taking. You see it the minute you get behind the wheel of an Israeli vehicle. To put it succinctly, most Israelis drive like maniacs. They use their horns instead of their brakes, and pay little attention to lanes. They are extremely impatient. Hoards of motorcyclists weave through traffic as if they believed they were immortal. Israeli drivers tend to take crazy risks--and in doing so, endanger everyone on the road. Many more people here die from traffic accidents than wars and terrorist bombings, and from the moment that you get behind the wheel of an Israeli vehicle, it is not hard to see why. People drive as if there is no tomorrow--perhaps because in their existential reality there is a very real possibility that there will not be a tomorrow. We Americans live in a huge, powerful, and secure nation in a very safe neighborhood. The sense of safety and security that this engenders infuses everything that we do. Israelis live with lots of risk--which turns them into gamblers in many aspects of life. Risk and safety both have their pros and cons. I'll take the Israeli playgrounds any day. But God help me when I get behind the wheel here. On my flight to Israel, I really enjoyed it. But it was very, very long. We had to take three planes! When I got to Israel, I remembered everything from when I was here when I was 4. Right now, I am in Tel Aviv. At my synagogue, a boy named Ben, who was a really good friend of mine, moved to Israel. I will see him while we are here. Today I took very long walks. First, we went along the beach, to a park on the beach. It was very fun, and I climbed all over the playground. Next thing, we walked to a lot of parks that were really fun. But then we went to a museum about the war between the Turkish and the British. On our way to the museum, we got kind of lost. I got tired from all of the walking, but I walked through it. The last thing that we went to was actually pretty fun--the gelato store. I got a gelato that was the flavor of bubble gum. It is very fun in Israel and I hope the next time I come it will be really fun, too. Gandhi famously taught: “Be the change that you wish to see in the world.” Our biblical ancestor Judah embodies this teaching in our weekly parashah, Vayigash. The Rabbis refer to Joseph as HaTzadik, “the righteous one.” He is a powerful and important figure in our tradition. But his almost too-pious righteousness renders him a little remote and distant. It is hard to relate to, and engage with, Joseph. Most of us connect more easily with Judah, the deeply-flawed man who wrestles with his moral choices and grows from his struggles. The midrash recognizes his greatness by pointing out that his name, Yehudah, contains all four letters of God’s Name, (yud-hey-vav-hey)—and is the origin of our collective name, yehudim, Jews. Judah is also the progenitor of King David and, by extension, the messiah. The messianic hope for an age of peace, justice, and compassion can only be realized if we, collectively and individually, commit ourselves to the kind of self-reflection and spiritual growth that we learn from Judah. The greatest heroes are not born but are always in the process of becoming. This is Judah’s legacy for us. When we first meet Joseph, as a teenage boy, he is blessed with prophetic, visionary dreams but profoundly lacking in wisdom. He foolishly flaunts his reveries at his brothers’ expense, thereby earning their deep enmity. His dreams of dominion are, in fact, accurate—but he does not yet know what to do with them. He speaks when he should be silent. Joseph’s prophetic gifts run deep—but they blind him to the needs and feelings of others. He is brilliant but insensitive, rich in vision but impoverished in empathy and action. Decades later, in this week’s portion, Miketz, Joseph grows up. Pain and adversity teach him compassion. Enslavement and imprisonment open his eyes to the suffering of others. Joseph learns how to listen, how to see into the hearts of those around him. This wisdom enables him to develop his prophetic potential into powerful action. Pharaoh calls upon Joseph to interpret two parallel dreams. Joseph does this—but does not stop there. He goes on to offer policy advice based on his interpretation: Pharaoh should set up a detailed system over all of Egypt to collect and store up food during the seven years of plenty, so that there will be provisions when the seven years of famine strike. Here, Joseph moves from words to acts. He acknowledges that in interpreting dreams, he is a mere vessel, channeling God. But the choice to translate those interpretations into a course of action is his alone. As Rabbi Adin Steinsaltz notes: “From being a dreamer of dreams, Joseph became the person of the dream... a man who experienced the dream... as a burden and a responsibility and a course of action from which there could be no digression. The Jewish writer Delmore Schwartz wrote story whose title is adapted from a poem by W.B. Yeats: In Dreams Begin Responsibilities. Indeed. As we grow older—and hopefully, wiser and more compassionate—our challenge is to translate our dreams and visions into well-chosen actions. During this week, which celebrates light and miracles, let’s think about how to live up to the responsibilities imposed by our dreams. Sometimes hope emerges in unexpected times and places, if we remain open to the possibility of light emerging out of darkness. Our Torah portion for this week, Vayeshev is filled with loss and despair. Jacob mourns bitterly for his beloved son Joseph, whom he believes is dead. Meanwhile, Joseph (who has, in fact, been sold into slavery by his brothers) is carried into exile in Egypt, where he will languish for many years in Pharaoh’s prison. As the portion ends, despite Joseph’s gift for dreaming and dream interpretation, he is essentially forgotten. In the darkest depths of the dungeon, all hope seems lost. It is no coincidence that we often read this parashah around the beginning of Chanukah (this year, the Festival of Lights begins on Saturday night). Chanukah arrives at the darkest season of the year, at the new moon closest to the winter solstice. The situation of the Maccabees, pitted against the mighty Assyrian empire, also seems hopeless. Like Joseph, they face a dark night of the soul. The old, familiar, comfortable paths are all closed off to them. They face overwhelming odds, with little sustenance and profoundly limited options. And yet Joseph ultimately rises and the Maccabees prevail. Each of these incredible underdogs defies the probabilities—and each begins by nurturing a tiny spark of light. Joseph always holds the memory of his youthful dreams, and the possibility that they might yet come true. The Maccabees muster the faith and courage to kindle light. In both cases, there are no guarantees that the flames of hope will endure. But Joseph and the Maccabees share the wisdom that in dark times, we must ignite our own little lights and hope that others—including God—will sustain them. We must take the first steps to banish darkness, and believe that when we do, our efforts will find succor and bring reward, to ourselves and/or to others who will follow. May this season of light bring hope and renewal to us all.